Halo Rover Hoverboard Review: Best Off Road Scooter? The Halo Rover is our #1 rated hoverboard for 2018! Strong, durable, safe, and with awesome off road capability, this is a board that a rider of any age would enjoy! It is currently reduced to just $547 (from $597) which is an awesome price for an off road hoverboard with such impressive specs. With the hoverboard market expanding in full force we are treated to one innovation after the next, and the Halo Rover all terrain hoverboard is one of the most interesting additions to the lineup to date. The company responsible for its creation started as a small business over ten years ago, back in 2005. They shot for the stars, and today HaloBoard is an international player with offices in the United States, France, Germany and Cyprus, counting over five hundred employees. 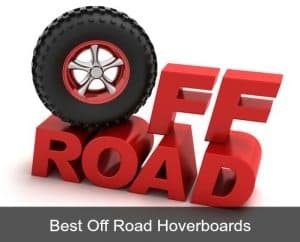 In other words, this is definitely one of the most proficient and reputable companies to enter the hoverboard race, and based on actual Halo Rover hoverboard reviews (from real users) this is actually head and shoulders above many of the rest on the market. 2 It’s got our safety seal of approval! 5 What are users saying? 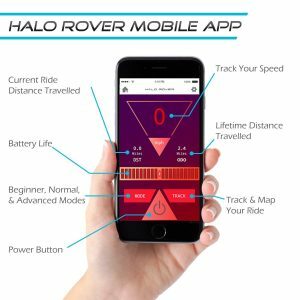 6 Halo Rover vs Epikgo – how do they compare? 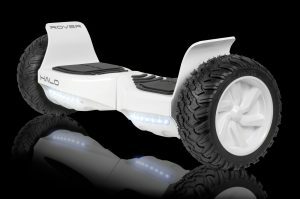 7 Halo Rover Hoverboard Price – How Much Does It Cost? 8 Is this hoverboard suitable for kids? 9 Warranty information – what if something goes wrong? 10 Verdict – Is this worth buying? 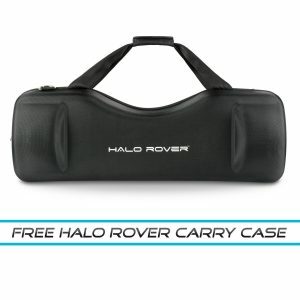 11 Where can I find the Halo Rover for sale? As with literally any product you’re planning on buying, the first step is to look at its specifications and see what it can concretely offer you. • Measurements of 9.1 by 8.7 by 27.5 inches and a weight of 32 pounds. • High-grade Aluminum is the main material used in the construction – this is far superior to the materials used in basic hoverboards. • The maximum weight capacity is of 265 pounds (standard hoverboards usually only have a max weight of about 220lbs). • It can travel a distance of 10 miles on a single charge. • It can climb hills up to an angle of around 18-20 degrees. • LED lights are included in order to increase your visibility for cars and other pedestrians. • The wheels measure 8.5 inches each in diameter and have all-terrain capabilities. This is bigger than the standard 6.5 inch wheels and it adds to the durability and stability. Unfortunately it does also add to the product weight too (it weighs about 32lbs). • At the moment, it’s the only model which includes protective guards for the wheels, also made from aluminum. 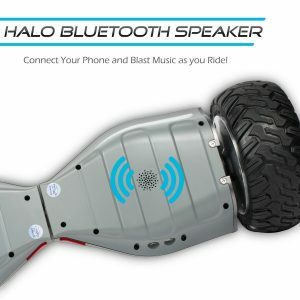 • It has an integrated Halo Bluetooth speaker so that you can play music from your phone while riding. • It comes with a smartphone application which allows you to keep watch over the speed you’re travelling at, the distance you’ve journeyed, and the amount of power left. The app can also be used to adjust various settings, such as the speed and the steering sensitivity. It even has three different modes for various users: training, normal and advanced. • It comes with self-balancing technology that makes the ride smoother and more stable. • It includes a heavy-duty carrying case with a shoulder strap, a rather convenient addition considering this hoverboard isn’t exactly on the light side of the scale. Watch out for special offers because sometimes this comes free with your purchase! It’s got our safety seal of approval! 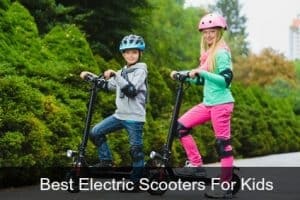 This self balancing scooter has received the coveted UL2272 certification, an official seal of approval from a renowned non-profit organization that the product meets all the safety standards of the industry. This means that all the stories and cautionary tales of hoverboards catching fire simply don’t apply here; the battery is completely safe and of very high quality. As a matter of fact, the people behind the HaloBoard even took the extra step to meet the IPX4 water resistance compliance standards, making it a hoverboard that can be used in the rain and won’t be damaged by splashes of water. That’s actually quite a big deal and the case isn’t being overstated – most cheaper boards do not have this kind of water resistance and cannot be used in rain or riding through puddles. As you might imagine from what you’ve just read, there are quite a few qualities that deserve some commendation. It’s built extremely tough and resilient, can achieve a relatively high top speed and maintain it for a respectable distance. It can tackle inclines and even small hills without much of a problem. The smartphone app is simple to use and will prove to be quite rewarding for hoverboard enthusiasts who are just starting their training. Finally, the safety certifications are a huge bonus as they are a solid source of confidence that the Rover will keep on working properly for ages to come. This certainly doesn’t happen very often, but this all terrain hoverboard virtually has no drawbacks to speak of, other than two minor issues, starting with the weight. Seeing as how you can travel for no more than one hour at top speed, you will run into moments when the board simply runs out of juice and you have to carry it. At 32 pounds it it’s pretty heavy, even with the carrying bag that comes with it – the average basic hoverboard (not all terrain) is usually about 5-10lbs lighter. Second of all, while the price is fantastic for all you’re getting, it objectively remains somewhat high for some of us – it’s not what you could consider a “budget” option. 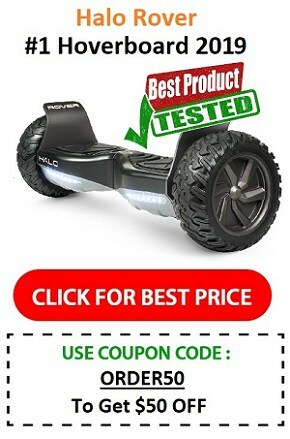 Halo Rover hoverboard reviews are incredibly positive – in fact its probably the hoverboard with the highest ratings available at the moment (check out the reviews on Halo Board). Even though the best hoverboards all now have UL2272 certification and are safe, many still do have technical problems and many (although fire safe) are still relatively poor in durability and build. Halo Rover vs Epikgo – how do they compare? The Epikgo all terrain hoverboard is the Halo’s main rival in the self balancing scooter industry. 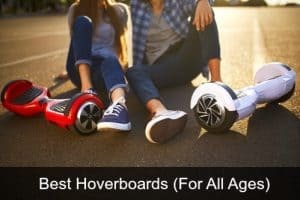 You can’t really compare either of these to basic hoverboards like the Swagtron or Razor Hovertrax as these are all terrain and are significantly stronger and more powerful in every way (of course this is also reflected in the price). So when comparing it to the Epikgo, what are the main differences, and which one comes out on top? The Epikgo does NOT have bluetooth capability whereas the Rover does, and that’s where the price difference comes in. I could go on – but you’ll find if you check out both products for yourself, they really are very similar. 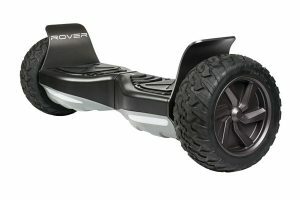 Halo Rover Hoverboard Price – How Much Does It Cost? If you’re interested in this hoverboard you’ll probably want to know how much does it cost? 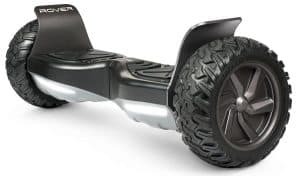 Being an off road hoverboard and more powerful in general than standard hoverboards, this is understandably more expensive. Not prohibitively expensive though! The official HaloBoard website is the best place to buy and has the best prices. That’s only about $200 more than a standard hoverboard, but this off roader has A LOT more power and functionality. Ask any buyer who’s tried both and I guarantee they’ll tell you spend that extra bit of money – its worth it! The official website stocks a wide variety of colors, has the blue racer edition, and the standard Halo Go. It’s worth checking visiting just to check out the user reviews and see if this is the board for you. Is this hoverboard suitable for kids? Judging by the size of it (8.5 inch wheels vs the normal 6.5 inch wheels of a basic hoverboard) you might wonder is it suitable for children. Actually the minimum weight is just 45lbs, so if your child weighs over this then there’s a good chance they’ll be able to control it without a problem. As long as your child is over the minimum weight and over the age of about 7 or 8 this off road board is suitable. Looking at the user reviews on Haloboard.com it seems many children and teens got this scooter for Christmas and are thoroughly enjoying their new board! And of course there’s no upper age limit – just an upper weight of about 265lbs. Warranty information – what if something goes wrong? The hoverboard comes with a 12-month worry-free guarantee, meaning that if within a year of purchase some manufacturing defect appears you can send the board back to be repaired or replaced if necessary. There are however some conditions under which a return cannot be requested, and though they mostly have to do with fraud I would recommend that you read through them anyways. Verdict – Is this worth buying? And thus, the time comes for the final verdict. Though it’s not one of the cheapest on the market, this is without doubt one of the best hoverboards you can find right now, and that goes double if you can get it on sale. This is THE #1 hoverboard of 2018 based on user reviews. It delivers on all fronts, there are no complaints to be found about it, it has all the certifications you could ever ask for and the company behind it has an impeccable reputation. Whether you’re new to the phenomenon or have been hoverboarding since day one, this scooter will offer an immensely rewarding experience… one which others cannot match for the moment. Highly recommended! 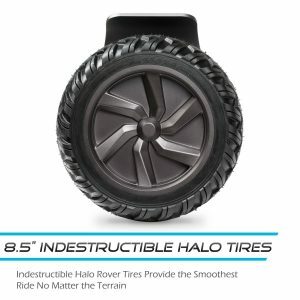 Where can I find the Halo Rover for sale? At the time of writing the best place to buy is on the official website. It has the best range of colors, models and also the best price. This is up there with the Epikgo as one of the best all terrain hoverboards on the market today. It’s not cheap, but IMHO its worth the price tag for its amazing quality and features.